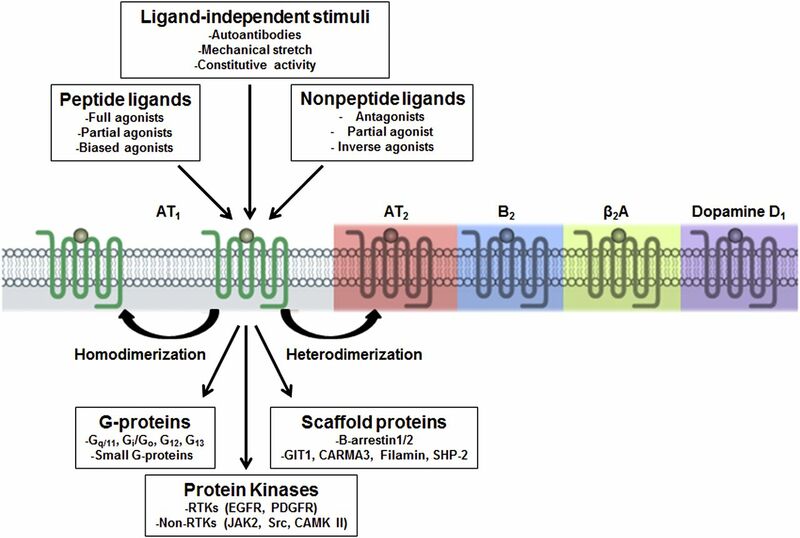 Literature search and analysis of primary journal articles on RAS receptors. The journal articles published on RAS were automatically retrieved from PubMed with the search term “(((((RAS[Title/Abstract]) AND angiotensin, or AT1 receptor, or AT2 receptor, or AT3 receptor, or AngIV binding site, or MAS1[Title/Abstract]) NOT medication adherence scale[Title/Abstract])”. The extracted references list had a total of 9147 reviews, opinions, commentary, lectures, and primary journal articles through the end of year 2013. The results were manually curated to retain relevant, nonredundant references. The primary journal articles were separated from the reviews, interviews, lectures, or commentary articles. The pool of these 7255 primary journal articles were further analyzed to illustrate number of publications under each RAS receptor as in the pie chart (A). The bar graph represents publication for each receptor/year (B). Python and Bio python scripts were used to aid in the literature search and analysis. 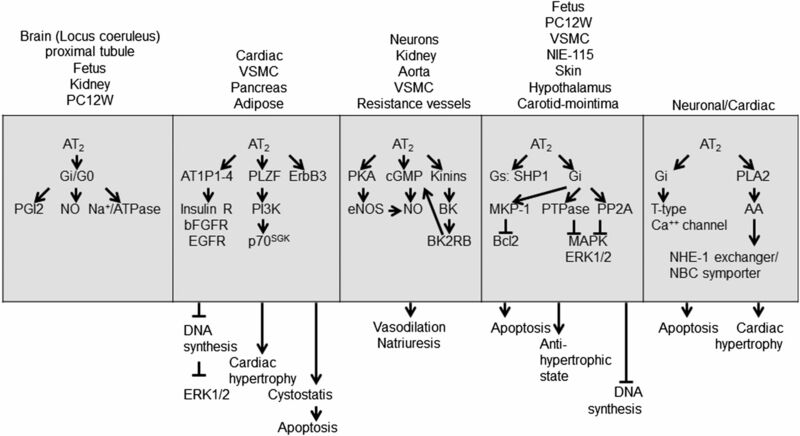 A current view of enzymatic pathways generating hormonal peptides of RAS and corresponding cell surface receptors. 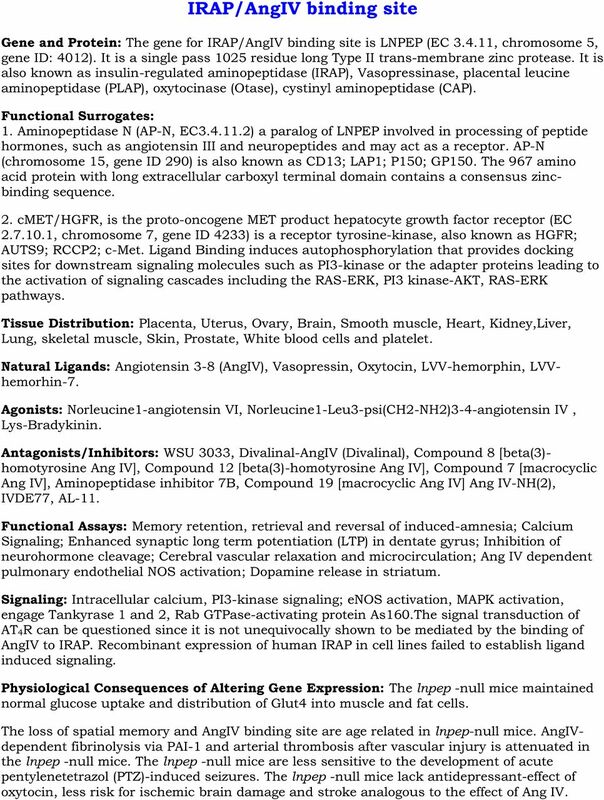 Surrogate enzymes, such as mast cell chymase, neutral endopeptidase, tonin, cathepsin D, kalikrine, and aminopeptidases are also known to participate in angiotensin metabolism in different contexts. Some authors contend inclusion of these enzymes as components of RAS. Inhibitors of different components of RAS are shown in red. Structure of human AT1 receptor. 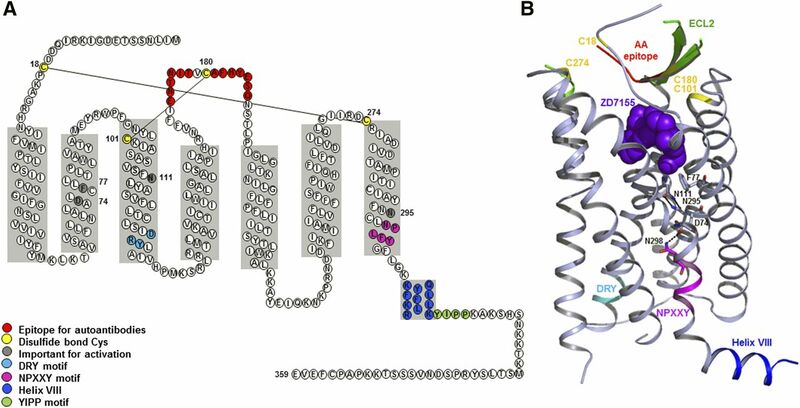 (A) Secondary structure of human AT1 receptor with precise depiction of α-helical borders and sequence motifs. (B). Overall three-dimensional structure of AT1 receptor-antagonist complex, detailing AT1 receptor with different motifs and antagonist. The critical hydrogen bond between Asn111 and Asn295 is indicated. Close proximity of residues such as Asp74 and Asn298 is suggestive of Na-ion coordination site. Sodium concentration may modulate receptor activation by agonists. 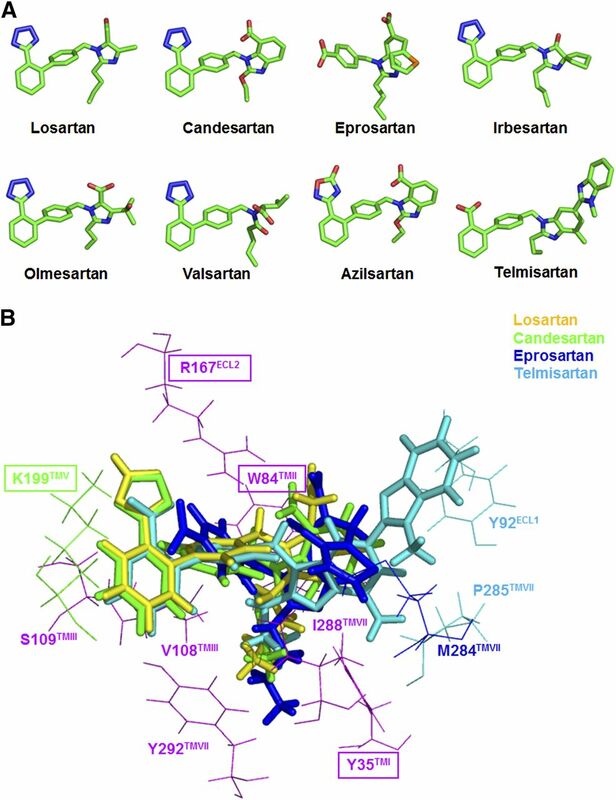 (A) Three-dimensional structural details of ARBs in clinical use; and (B) interaction with human AT1 receptor. Differences in the efficacy of different ARBs may be due to small differences in interaction of shown ARBs with residues such as Tyr92, Trp182, Lys199, Met284, and P285. Single residue variations of hAT1 receptor in population. 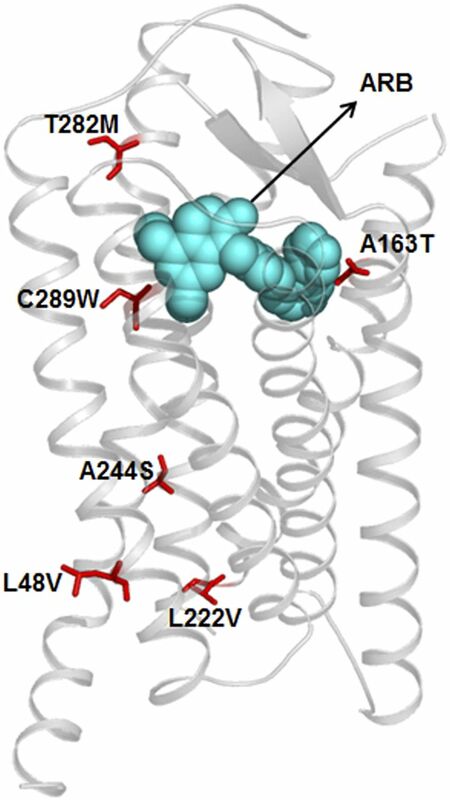 Location of reported variant residues are shown in an ARB bound three-dimensional model of the receptor. Schematic representation of AT1 receptor as a pluridimensional signal transducer. Discoveries made in the past 15 years suggest that AT1 receptor as a transmembrane transducer capable of sensing multiple modes of stimuli and elicit diverse responses as shown. Diverse signaling by AT2 receptor. Each tile represents signaling pathways reported in different cellular and tissue context leading to physiologic or pathologic consequences. See main text for details. 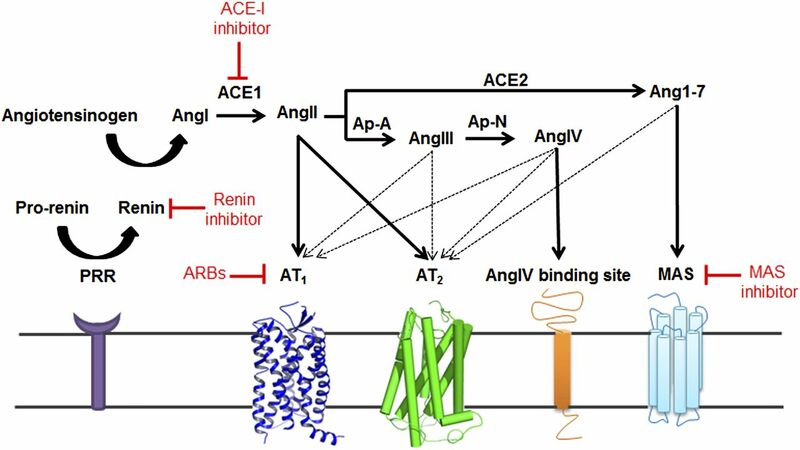 IRAP/AngIV binding site. See main text for details and Supplemental Material. Literature search and analysis of primary journal articles on MAS. The journal articles published on MAS were automatically retrieved from PubMed with the search term “(((((MAS[Title/Abstract]) AND angiotensin OR MAS1[Title/Abstract]) AND angiotensin[Title/Abstract]) NOT meconium aspiration syndrome[Title/Abstract]) NOT medication adherence scale[Title/Abstract])”. The results were manually curated to add or remove relevant or irrelevant references, respectively, and the primary journal articles were separated from the reviews, interviews, lectures, or commentary articles. The final curated list had a total of 337 primary journal articles until the end of year 2013. These articles are further analyzed to illustrate (A) number of publications per year as a bar graph and (B) percentage of publications per functional category as a pie chart. The functional categorization was done by searching for key words in the abstract and the title representing a given category. Please note that in the functional categorization, some articles are present in multiple functional categories and therefore 100% represents a higher total of articles (524) instead of 337. 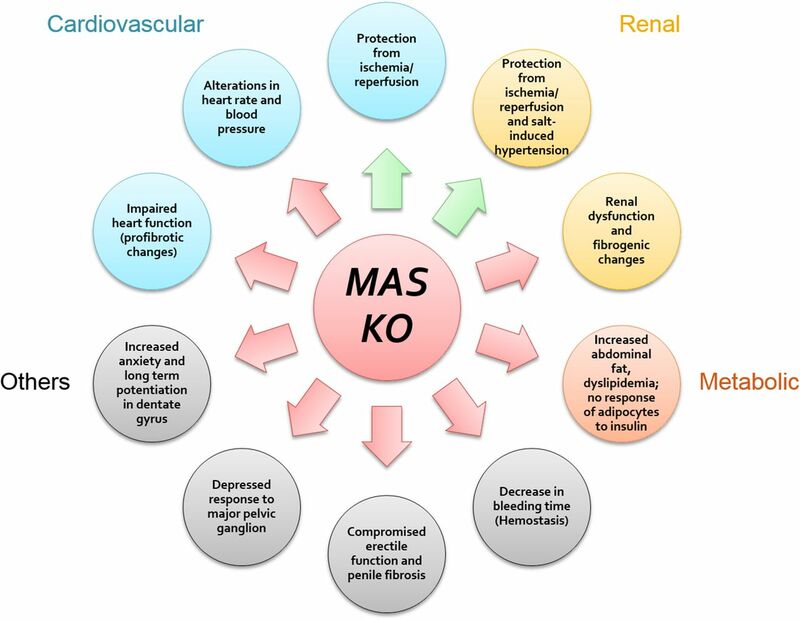 The figure helps to illustrate the general point that the number of publications on MAS have dramatically increased post-2003 and that MAS literature is primarily representative of the cardiovascular and renal function category. Python and Biopython scripts were used to aid in the literature search and analysis. Summary of phenotypes reported in MAS knockout mice. The figure summarizes multiple phenotypes that are reported in literature in mice lacking the MAS gene. Both damaging (red arrows) and protecting (green) arrows are observed in knockout mice. See main text for references.